Android is at it again with more engaging activities like having a complete music studio. probably, we might have come about music converter app for Android (eg. Mp3 media converter), song editor and scrapper (eg. Ringtone maker), DJ apps like (DJ5 or Edjing), Karaoke midi stripper and many other Android entertainment apps. But today, I have gotten few and reliable Android apps that can turn your phone into a more engaging and complete music studio. This is not a hype where you get promised for something to happen. It is 100% reliable. These apps are free except when you opt for a more features and add-on. Just like a conventional music studio; you train your voice, study your vocal range, sing songs and among other stuff like that. Sing Sharp also lets you do the same and more. This app is free and ads support unless you would opt to remove ads through pro licence. Here, it tracks and records your voice pitch in relevance to the key it fails. It can go up or down depending on your vocal depth. If you really know about music and notations, you are good to go. You can as well save your vocal stats to see your improvements. Your vocal range determines what keys will be given to you during “Warm up” and “Sing song”. This is for rehearsal. You are given a key to sing along in bits. You must have checked your vocal range before proceeding on this step. It comes with lyrics which are basically sound notes and not normal words. You will be accessed after each warm up practice. You can also pause or restart during practice. You can as well play what you just recorded after your practice. If you score “0”, that shows you really need improvement. Now you are ready to create a song either from preloaded tones or from your saved beats in your local storage. You can start to create a song from your beat directly with Sing sharp. Caustic is a beat maker app just like FL Studio. If you are not too conversant with beat making, just download free beats and tweak it with Sing Sharp. 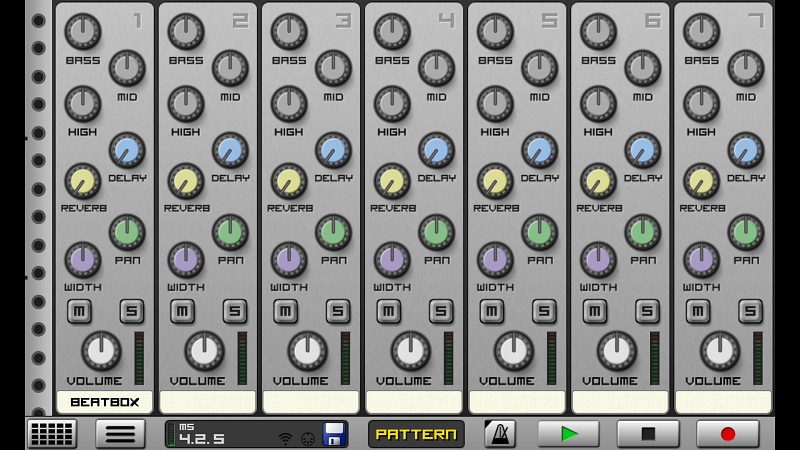 Caustic is free for demo uses. This is the master when it comes to organisation. It creates beats using some simple instruments. It doesn’t only creates beats, it also allows you to create songs, share songs to its community and more. Music Maker Jam is free but requires registration either your email or Facebook in other to join its community. It does not necessarily require you to be connected during music making except you want to buy extra cheap music styles or engage in community. It can be technical working with this app. It has four music tools by the left when you open “Make music”. These tools are very simple to acquaint with. I advice you follow the tutorial to walk you through. You can add multiple working area since by default, Music maker Jam allows only 8 styles on a pane. You are given two free options to choose either “House Choir”, “Rock Radio”, “HIP HOP” depending on your genre. Remember to save and record your project. Recording during your project makes it easier to export it as a beat. Among the tools, the last one allows you to record your voice on any of the 8 beat styles. Just tap on the microphone icon with your headset connected. You are just given 15 seconds on each. To complete your complete Android music studio, it is recommended that you create your song beat, then export it as a separate file to be used with Sing Sharp. Since Sing sharp helps monitor your vocal balance and correspondence with the track. You can learn more working with Sing Sharp and most especially Music Maker Jam. Caustic can be optional. Although, recording with MMJ is awesome. I hope you enjoy another dimension with your droid.